We spend one third of our lives asleep. It is obvious that the quality of our sleep affects our general well-being. Ensuring that a hard day’s night will leave you refreshed is less obvious, though. While the length of you sleep, how bright the light in the room is, how long you actually sleep etc. are all important, it is easy to forget that what you sleep on is just as vital. Choosing the best mattress and pillow might be the necessary between a day of painless success and a painful drag of unfulfilled dreams – especially for those suffering from neck and/or lower back pain. Out of the many pillows available today, arc4life cervical linear traction neck pillow was voted as one of the best pillows of 2017. The pillow is filled with top-quality polyester fiber. No latex, or rubber is used in production, and so the pillow does not cause an allergic reaction. Each pillow is hand-stuffed, weighed and inspected five times to ensure the highest quality (and no lumps). Thanks to its shape, the pillow ensures proper neck traction and correct posture of the sleeper, which, in practice, means greater comfort during the night. By promoting the natural alignment of your spine, the pillow also allows for a less restricted posture during the night. As already mentioned, the pillow was designed not to trigger any allergic reaction. It is recommended that a dust cover be used so that mites and other allergens can be disposed of during the washing. The arc4life pillowcase is designed to fit the pillow, can be easily zipped and quickly washed. If you sleep on your back, you have two options. You can either rest your head between a V-shaped contour, while the neck rests on the roll. Alternatively, you can turn the pillow 180 degress and just rest your neck comfortably on a single roll. The pillow is also created to be both back- and side-sleeper-friendly. If you change your position to the side during the night, you will unconsciously move to the side of the pillow. Ideally, it is the side of the pillow that should fit the side of your body. 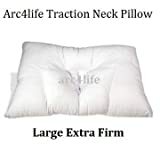 Arc4life cervical pillow was designed with that in mind. This cervical neck pillow will satisfy both back- and side-sleepers. What are the advantages of the cervical pillow for neck pain? Firstly, no more pain! When your head and neck are supported correctly, pressure is relieved and you will wake up with no neck and muscle pain. Secondly, the blood circulation is enhanced when your muscles are relaxed. Moreover, with your spine aligned in a natural way, you will have a better posture. Ultimately, the superior comfort will allow you to enjoy deep and sound sleep and wake up relaxed and refreshed. It should be noted, however, that the pillow might take some time of getting used to. Once you have adjusted to sleeping on the cervical pillow, however, you will not regret it. Moreover, while most pillows are designed for either hard or soft mattresses, the cervical pillow can be successfully used with either. The price of the product, while slightly more expensive than that of regular products, is compatibile with the quality and durability of the pillow. Well, basically, anyone. Whether you experience mild stiffness in your neck after a night’s rest or a burning sensation in you neck, shoulders, or even legs – the pillow will help you get rid of the pain. Patients who suffered from cervical pain stemming from serious diseases or even operations, also enjoyed the pillow. Arc4life Cervical Neck Traction Pillow for Sleeping - Queen Standard Size Side Sleeper and Back Pillows for Beds Neck Pillow for Sleeping Standard Neck Pillow for Sleep Medium 24"x17"
Cervical Neck Traction Pillow for Sleeping - Travel Neck Pillow Toddler Pillow Small Pillows Side Sleeper and Back Pillows for Beds Neck Pillow for Sleeping Small Neck Pillow for Sleep 20"x15"
In a nutshell, the arc4life cervical pillow is a small masterpiece. The design of the pillow, its shape and the fabrics used fulfill all expectations. It is an investment in the future: let’s not forget that a rested mind and a pain-free body operate better both in our business and private lives. Why should a bad pillow decrease the quality of your life? Get a cervical traction pillow and forget about the pain.